People often think about tapping into their retirement savings when money gets tight. Sometimes withdrawing money from a tax-deferred retirement plan can prevent a financial disaster, but taking an early distribution comes with stiff taxes and penalties. Figuring out whether cashing out your retirement is worth it involves comparing other options to the taxes and penalties you'll owe. We've outlined a simple IRA withdrawal calculator to help you decide. I am thinking about taking an early withdrawal from my traditional IRA account to pay an outstanding credit card bill for car repairs. I'd like to buy a home in the near future and having this outstanding bill is impacting my credit rating. I currently pay the bill on time and have never been late, but I want to get rid of the debt. I'm trying to figure out if the cost in taxes for the early distribution is less than the cost of paying the minimum on the CC every month. The APR on the credit card is 10 percent. Can you help me figure this out and tell me if there are other factors I have not considered? Your age when the distribution was made. What type of retirement plan you have. How much you plan to withdraw. What tax bracket you will likely be in at the time of the withdrawal. There's no penalty for first-time home buyers when they withdraw from an IRA, or for unemployed persons using the money to pay for health insurance. There's no penalty if the money is used for college tuition or for high medical expenses. Early distribution penalties apply if you withdraw money from a retirement plan before you reach age 59 1/2. The penalty is 10 percent, and this is in addition to any income taxes you'll owe on the withdrawal. The penalty increases to 25 percent if you withdraw the funds from a Simple IRA and you began participating in that Simple IRA within the past two years. If you're close to age 59 1/2, you might want to wait before withdrawing the money so you can avoid this penalty. There are important exceptions to the penalty, however. If you withdraw money to purchase a house or pay for medical expenses, it may not apply. The allowable exceptions differ by the type of retirement plan you have. 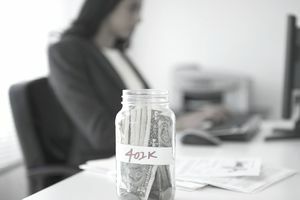 Distributions from a 401(k) or 403(b) retirement plan have fewer exceptions—you can only dodge the penalty if you are over 55 years old and are retired or have left your job, to pay for high medical bills, or as part of a divorce settlement. You'll next want to determine how much tax you'll have to pay on the distribution after you've figured out the penalty. The IRS treats distributions as ordinary income. This means they're taxed at your marginal tax rate. Making a large withdrawal from a retirement plan might even cause you to move up to a higher tax bracket, so you'll want to pay attention to the income ranges for different tax brackets in the current year. The IRS changes them periodically. Multiply the amount you plan to withdraw times your marginal tax bracket to get a quick estimate of your tax liability, then add in any penalty. The total will be how much federal tax you'll owe on the withdrawal. You should estimate any state taxes as well. The reader with the above scenario didn't provide any information about her income or tax situation, so we'll make up some numbers for her just to see how the math works. Let's say she qualifies for head of household filing status, that she is aged 35 when she withdraws the funds, and that her taxable income after taking the standard deduction and personal exemptions is $50,000. This would put her in a 25 percent tax bracket. Her income would increase to $60,000 if she withdraws $10,000 to pay for car repairs, but she'll still be within that 25 percent tax bracket. Her federal tax impact would be $10,000 times 25 percent for tax plus the 10 percent penalty, or $3,500. She's subject to the 10% penalty because paying for car repairs isn't on the list of penalty exceptions. She may also be on the hook for state income taxes and possibly state penalties. This $3,500 in extra federal taxes is the cost of tapping into these retirement funds. What other alternatives does the reader have? She could continue to pay interest on the credit card balance. This reader's card comes with a 10-percent annual percentage rate, which means that she'll rack up an interest of $1,000 over the course of a year on a $10,000 balance. This assumes that the balance remains even over the course of the year. Using a minimum credit card payoff calculator and making the further assumption that the credit card requires a minimum payment of 2.5 percent of the balance each month, our reader would ultimately pay $4,888.25 in interest over 20 years to pay off the car repairs. So what's the better deal: pay $3,500 now, or pay $4,888 over 20 years? It's a personal choice, but the answer may lie in paying off the credit card bill over time. Incurring a large tax bill should be avoided whenever possible. The credit card can be paid off faster whenever extra money is available, or more slowly when finances are tighter. What other options does the reader have? Many 401(k) and 403(b) plans offer loans to employees, although loans are not permitted against IRAs by law. These loans can help her meet short-term financial hardships while avoiding the hefty tax and penalties associated with withdrawal. She might also shop around for a lower interest rate loan, try to earn some extra income, or create a budget to handle the new financial situation. Leave the retirement funds for when they'll be needed most: after age 59 1/2 if the taxpayer becomes disabled, or when facing other situations for which a penalty exception applies.